A phenomenal abundance of sea lions and humpback whales feeding tightly together on schooling anchovies in California's Monterey Bay continues to inspire awe among passengers and scientists. But nobody seems as excited by this magnificent spectacle as "Whiskie the Whale Spotter," a boxer/shepherd mix who was rescued by Peggy West Stap of Monterey Bay Marine Life Studies, and is a regular on the company's daily expeditions. Whiskie the Whale Spotter was named because she possesses a special talent for alerting the crew to the presence of whales and dolphins. "She usually sits in her favorite spot, the captain's chair," Stap explains. "If she runs to the front or back of the boat, 90 percent of the time there's a whale or dolphin. ... She can either hear or smell them, or both. "She was never trained to spot whales. She is a rescue dog from Michigan, and I think she feeds off our excitement when we observe whales and dolphins. She is a very smart girl." Whiskie hasn't had to use her talents much recently, because an unusually high abundance of anchovies have kept humpback whales and sea lions in close proximity to port, and the feeding frenzies can be spotted from more than a mile away. 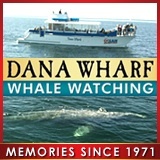 Says Stap: "The Monterey Bay National Marine Sanctuary has been the center an incredible wealth of whale activity due to the abundance of anchovies. "This has been going on since September. There are as many as 50 to 100 humpbacks in the bay in a given day, along with thousands of sea lions. [Tuesday] was the most sea lions grouped together that we had observed. "It appeared as if you could walk across them they were so tightly bunched. It was an amazing sight to behold." You'll get no argument from Whiskie. I wonder if I could train my dog as a whale spotter? So cool!